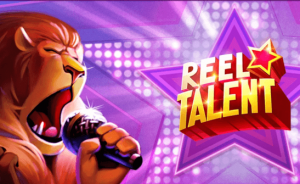 If you’ve been following our news, you already know that Microgaming released a brand new game inspired by a talent show, which goes by the name of Reel Talent. Sure, this slot has a crowd-pleasing animal theme. But it also offers excellent win possibilities thanks to the multiple features and the progression it offers. But the best of all is that Microgaming subsidiary studio(JFTW), gave us loads of insight on this new release. And because of this, we’re able to tell you that you’ll trigger the SuperSpins feature (on average) 1 time ever 28 spins. What’s more is that you are likely to hit a big win after 75 Spins! And a Mega Win after 152 Spins! Want more insights? Then don’t miss the review below! Bonuses & features: Symbol Storage, Re-Spins, and Stacked Symbols. To sum up, when you play Reel Talent you’ll have access to 3 different types of Re-Spins. But don’t get confused by the name of the features. This slot does not offer any Free Spins. The different type of Re-Spins you’ll trigger entirely depends on the symbols you have in storage. But before we give you a bit more information on the three different Re-Spins maybe you’d like to know how to store symbols, right? So, for a symbol to appear in the storage area on the left-hand side of the reels, you’ll need to create a winning combination. To fill up the storage, you’ll need three consecutive wins. As we said above the Re-Spin feature, you’ll trigger entirely depends on the symbols you have in storage. But let’s keep things simple! Three different symbols trigger the Showtime Re-Spin. 2 identical symbols will trigger the Big Stage Re-Spin. And finally, you’ll unleash the Solo performance when you fill up the meter with identical symbols. In many cases, the symbols that appeared in your storage will always appear stacked on the reels. And the Re-Spin will always only contain those symbols. Reel Talent offers huge winning potentials when you manage to fill up the meter with three identical symbols. In fact, doing so means that you’re guaranteed to have a full screen of identical symbols, and we all like that! To conclude, if you’re a fan of Britain got talent or the X-factor, this game might just hit the right note for you. But to know if you’ll give it a thumbs up or an X, you’ll need to try it at any casinos listed on this site! And a good thing about it is that even if this game offers a progression feature, it’s not excluded from the wagering requirement of a bonus! So try it now and have fun!